Chhanar Jeelapi is a dessert made with fried, pretzel-shaped pieces of dough soaked in cardamom-flavored syrup. My mom makes this during gatherings with our family friends and she’ll serve it after dinner with tea. 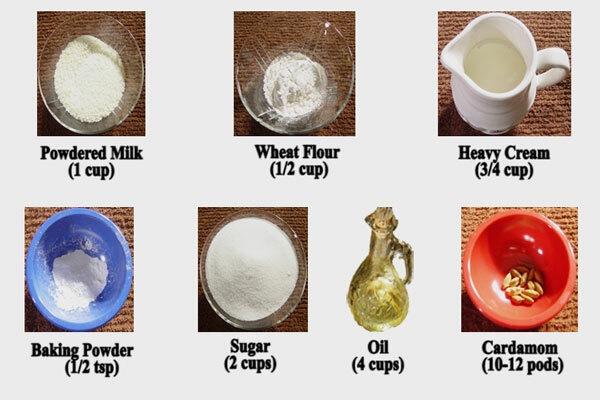 1) Pour the wheat flour, powdered milk, and baking powder in a large bowl and mix thoroughly. 2) Slowly add the heavy cream into the mixture while stirring constantly. 3) Mix until you’ve made a soft dough with a smooth, consistent texture. 5) Turn on the stove and put 4 cups of water in a saucepan. 6) Add the sugar and cardamom pods and stir. 7) Continue heating until it comes to a rolling boil and let it boil for 5 minutes. 8) Divide the dough into 2 halves. 9) Then divide one of the halves to another half. 10) Divide a third time. 11) And divide for the 4th time to make a total of sixteen balls of dough for sixteen jeelapis. 12) To create the pretzel shape, roll a ball between two palms to make a string about 8 inches long. 13) Bring one end of the roll to the middle and connect it. 14) Then bring the other end over the bent section. The chhanar jeelapi will maintain this shape when finally cooked. 15) Repeat this with the remaining 15 balls of dough. 16) As the sugar dissolves in the boiling water, turn off the heat but leave the syrup on the stove. 17) To fry the jeelapis, add oil to a moderately hot pan and continue heating till it feels hot. 18) Add one jeelapi to the oil and see if the oil is hot enough. If it sizzles, add the others. 19) Stir the frying jeelapis, and when it appears brown on one side, turn over and continue frying on the other side. 20) When it is deep brown on both sides, pick it up from the hot oil and drop it immediately into the hot syrup. 21) The jeelapi will absorb the syrup as it cools down. 22) Repeat these steps with the remaining jeelapis. 23) And then cool them to room temperature. If you prefer, you can cool them in the refrigerator before serving.